In September 1957, Student Government Association President Ken Mattingly ’58 wrote a letter to incoming Auburn freshmen. You’ll sometimes hear that the Auburn Creed didn’t become popular with Auburn students until years after it was written. That’s not true. Letters like Mattingly’s — from other student leaders, from administrators — were common in the 1940s and 1950s. The Creed first appeared on the front page of the Jan. 21, 1944 issue of The Plainsman. The paper had reprinted it nearly 10 times by the time it ran Mattingly’s letter and had referenced it dozens more. 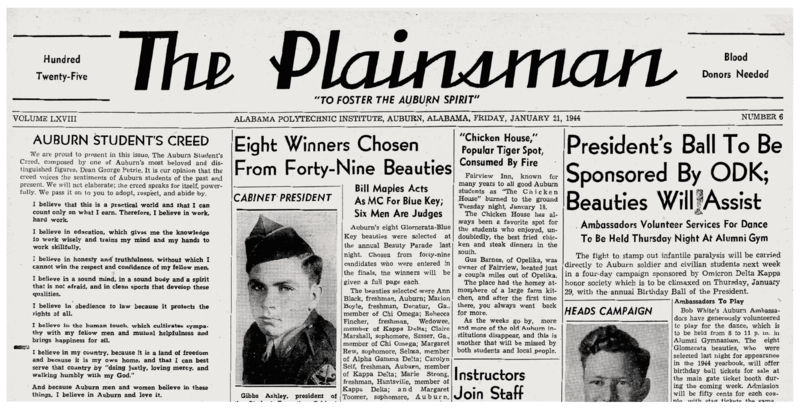 As early as 1945, any freshman coed who couldn’t recite the Auburn Creed for an upperclassman at any time of the day or night risked having her name added to a blacklist hung at Toomer’s Corner. The first 16 pages of the 1950 Glomerata? Nothing but photos illustrating the Auburn Creed. 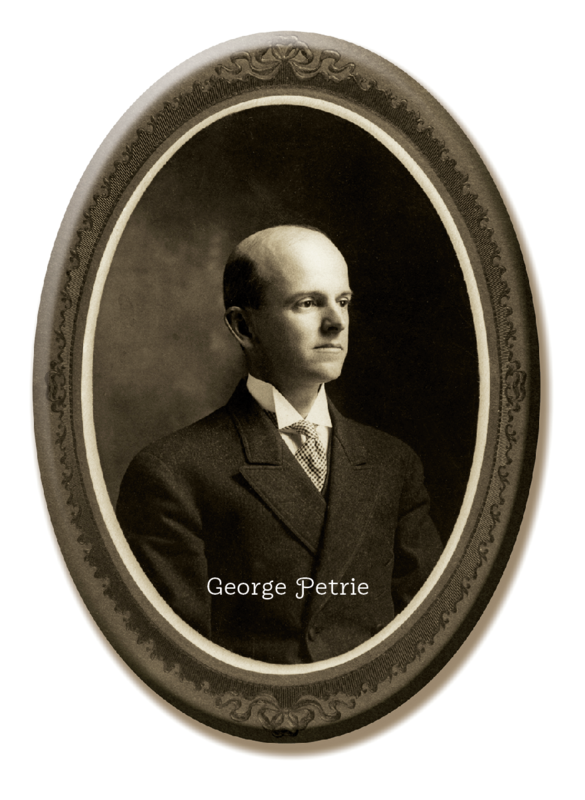 All of which is to say that the thing was a hit from the start… because, thanks to George Petrie, Auburn finally had an answer. It was Nov. 12, 1943, the Friday before what should have been the Auburn-LSU game in Birmingham. Physically, Petrie was doing better than he had a year earlier when, for health reasons, he’d handed over the reins of Auburn’s history department after more than half a century. Emotionally, he may have been worse. His wife had passed a couple of months before he’d retired. He was still heartbroken. His academic writing had almost completely dried up. He barely had it in him to reply to letters. And now, thanks to Japan and Germany, he couldn’t even look forward to football. Back in July, a week before Petrie mustered the strength to speak on Auburn tradition to a group of 400 soldiers enrolled in an API crash course in engineering, API President Dr. Luther N. Duncan decided that the athletic department didn’t really have much of a choice. So, believing it to be a practical world, Duncan announced that for the first time in more than half a century — and for who knew how long after that — the great game his former professor George Petrie had brought to Auburn would not be played on the Plains. They’d have it at the stadium. There’d be a talk titled “Football Players at War.” Instead of papier-mâché bulldogs, they’d burn effigies of Hitler and Hirohito. People had talked about it for decades, and not just Auburn people. It’d been written about and capitalized in newspapers dating back to the 1800s. 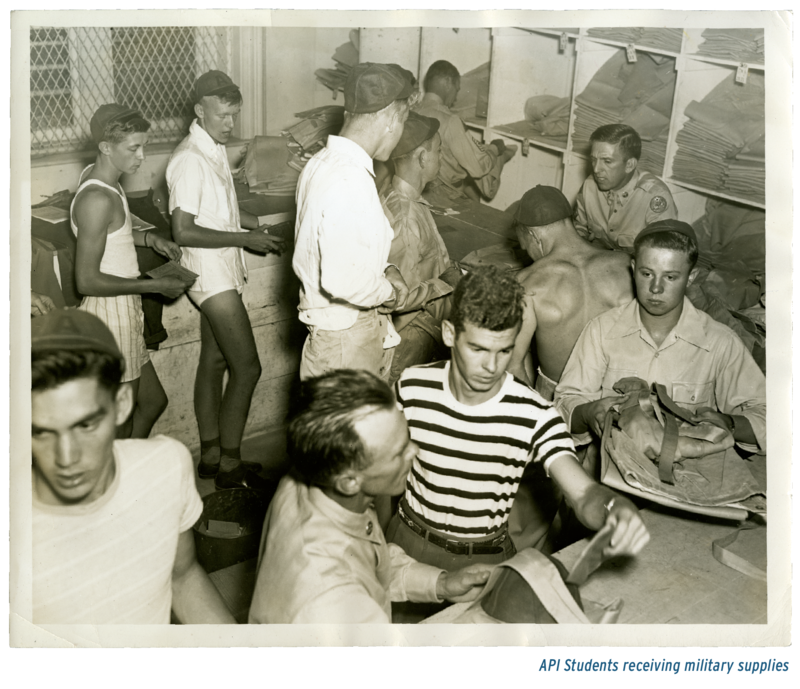 Letters from Auburn men overseas arrived at The Plainsman office each week describing how their fellow soldiers envied the sense of camaraderie Auburn men shared, describing how others marveled at just how loud the “War Eagles” could get when Auburn men got together. “On every fighting front in this war, you’ll find Auburn men in there with the best fighting for American democracy and the standards taught at API,” one soldier wrote a few weeks earlier. Strong on your way to class. Strong on your way to the dance. Strong on your way to the front. Strong when the team won. Strong when the team lost. Strong even when there wasn’t a team! But why? What was it? What was it about Auburn? Petrie got out a pen. 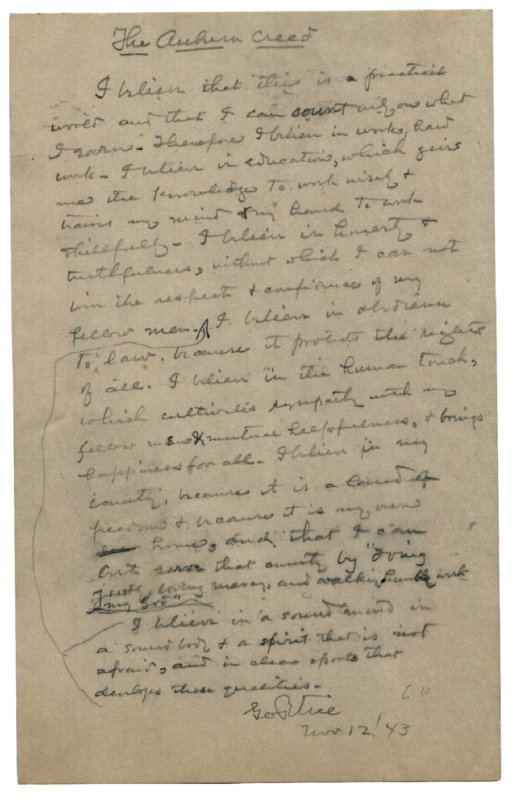 “I believe that this is a practical world and that I can count only on what I earn. Therefore, I believe in work, hard work. And because Auburn men and women believe in these things, I believe in Auburn and love it,” Petrie wrote. Seven months later, on June 6, 1944, a former Auburn football player and assistant football coach named Shug Jordan waded ashore Utah Beach in France to serve his country. He’d managed to avoid serious injury in the invasions of Sicily, Italy and North Africa (where, just like the letters described, he’d spent New Year’s Eve 1942 with six other Auburn men shouting “War Eagle” across the Mediterranean toward Mussolini). Not this time. Not on D-Day. Minutes into the battle, flak from a German 88 tore through his left shoulder. It hurt like hell. He fought until he couldn’t move his arm. Inside one of his pockets, damp and fading and maybe even stained with blood, was a clipping from an issue of his college newspaper published earlier that year. A friend back home had mailed it to him. It was something written by one of Shug’s former professors, something about the benefits of a spirit that is not afraid. Seventy-five years later, what The Plainsman passed on is etched into campus buildings and even the ground at Toomer’s Corner. A woman who appeared on the TODAY show in August had it on her t-shirt. It’s the script for commercials. It’s everywhere. The paper itself eventually adopted a line from the Creed as its slogan and put it on its masthead. It wasn’t just a new Auburn catchphrase. It was more than a new motto. It didn’t just sound good. The reason The Plainsman’s original wish for the Auburn Creed came true was because the Creed confirmed, and continues to confirm, what people who believe in Auburn and love it feel deep down: that Auburn is — somehow, someway — undeniably special. Every school has a battle cry, a fight song. The Creed isn’t that. Only one line even references sports, briefly, and not for sports’ sake, but for the role of sports in making Auburn men and women. It may look great flashing across Jordan-Hare’s giant scoreboard, but that first line about “hard work” isn’t describing football practice. The Auburn Creed isn’t an ode to conquering a rival. It’s a practical prescription for conquering the world. America’s fourth space shuttle mission, Columbia’s fourth test flight, was a big deal. The launch was set for Sunday, June 27, 1982. If the thing came back in one piece a week later on Independence Day, it would be officially declared operational. It was also the first flight to include military experiments, which, thanks to a couple of cosmonauts who had just gone into orbit, took on a little extra significance. But some of the biggest buzz with T-minus a week to go was about the astronauts themselves. The mission would be the first piloted by two graduates of the same university, which also happened to be the alma mater of the Director of Kennedy Space Center, and at least three other NASA scientists or contractors directly involved in the mission that everyone was praying wouldn’t, like the three before it, be delayed at the last second. On Saturday, hope suddenly seemed lost. A hailstorm put 200 dents into the shuttle’s heat-resistant tiles. The crew repaired them through the night. It was hard work. It paid off. By morning, all systems were go. Liftoff was perfect and on time, making it the first shuttle mission to start on schedule. Half a million people along Florida’s highways and beaches pointed toward the sky as 1954 Auburn graduate Henry Hartsfield and 1958 Auburn graduate (and former SGA President) Ken Mattingly walked humbly with their God at 17,500 miles per hour. Behind them, included among the most powerful technology in the world, was a copy of the Auburn Creed.